Note: We recently reviewed the new version 2 of the Adventurer. The updated board is the same price as the old model so we suggest you check it out. You can read our Adventurer 2 review here. A great quality board at an unbeatable price that performs like a hardboard. Paddle boarding, in general, is a great way for people of all ages and abilities to get out on the water and have fun. This stand up paddle board is completely inflatable and created from military grade fabric. Because it’s inflatable it can be easily stored and taken just about anywhere providing fun for all the family. The package deal features not only the board but also an air pump and a 3 piece adjustable aluminum paddle. 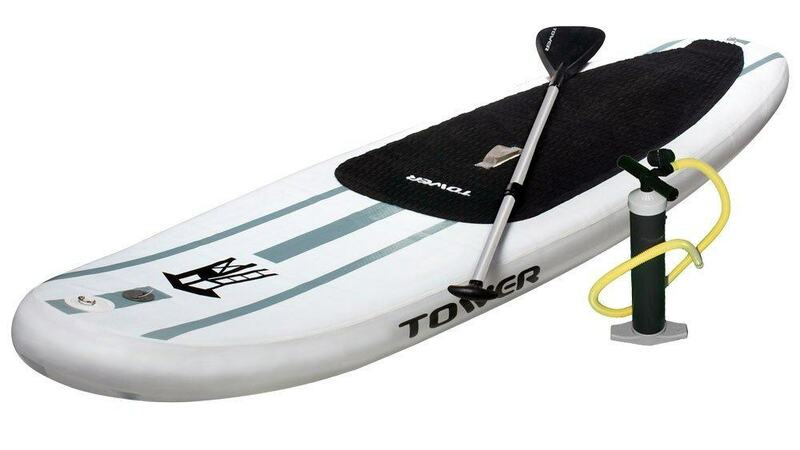 The performance of the Tower Boards Adventurer easily rivals that of a fiberglass board. The extra 2” of thickness means that a large adult can easily be supported without getting their toes wet. It’s also the perfect product to use with both adults and children as the weight should be comfortably supported. In some ways, the performance surpasses that of a hardboard because there is no need to worry about dents and dings. Even in the most treacherous of waters such as white water rapids this model will hold its own. The model is not built to be fast, but it glides through the water smoothly and tracks nicely. 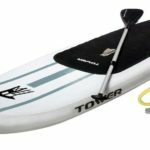 This product by Tower Paddle Boards is extremely durable as it is made from military grade PVC material using a drop stitch construction method. This will ensure that you don’t need to worry about board cracks ever again. When the product is fully inflated the strength of the construction is immediately apparent as it feels very similar to using a hardboard. The maximum inflation is 15 PSI, you will likely find the 10PSI is enough for the board to feel safe and sturdy. Interested in seeing how the board is inflated and deflated? Check out the video below. The board is around 9 Ft. 10 inches long. It’s approximately 32 inches wide and 6 inches thick. The weight when inflated is 24 lbs. It’s extremely strong and can hold up to 400 lbs. It has 1 large removable center skeg. It has 2 smaller attached side skegs. A lot of other SUPs on the market are only made to be 4” thick however the Tower Paddle Boards Adventurer is 6” thick and 4 x as rigid allowing it to hold twice the weight of other models. The product can be stored easily, as when deflated and rolled up it is only about the size and weight of a sleeping bag, which means it can easily be taken on beach vacations. There is no danger of cold temperatures damaging the material. The maintenance of the product is extremely easy, all that is required is soap and water. Seat attachments can be added to the board for a more relaxed paddle boarding experience. This product comes with a 2-year manufacturer’s warranty. The traction pad is diamond grooved and so is extremely comfortable to stand on. There is a hand hold strap in the center of the board which is great when using the products with kids. The package does not include a carry bag, which is a bit annoying when the board needs to be transported. There are no bungee cords with the package. There are no D-rings to tie down the gear. The fin attachment is connected using a hex screw, which although makes for a secure fin, it’s pretty easy to lose the screw. Overall this particular inflatable model is a well-constructed SUP. It’s made from tough materials making it extremely rigid, and the performance is better than expected. This would be the perfect product for anyone that wants to begin paddle boarding and is looking for a smooth and sturdy board to get them going. I’m considering to buy this board. I’m a beginner and I think you’ve made points about it being good for starters. Good Stuff, keep it going.